This week’s quote is from Alan Turing (died 1954). 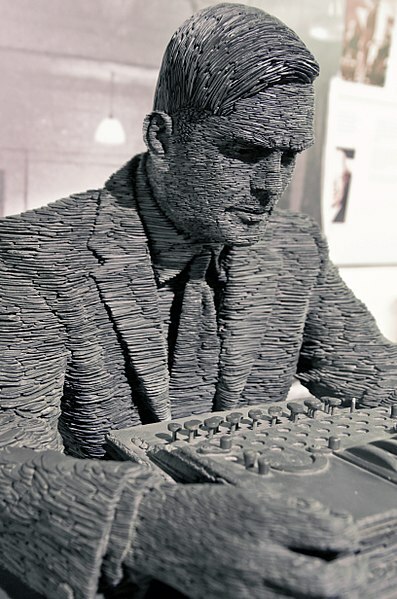 Statue of Turing by Stephen Kettle at Bletchley Park, commissioned by Sidney Frank, built from half a million pieces of Welsh slate. Photo: Antoine Taveneaux [CC BY-SA 3.0 (https://creativecommons.org/licenses/by-sa/3.0)], from Wikimedia Commons. That’s a feeling that many of us have and which drives us forward. There is so much that needs to be done – let’s get on with it today, tomorrow and the next day! I missed the live programme on Tuesday evening where the public voted for the icon of the twentieth century. No plot spoilers here, but Chris Packham presented the case for Alan Turing who had won the ‘scientists and mathematicians’ round earlier. Turing did far better in the overall vote than I had expected (and just possibly better than he deserved considering who he was up against (controversial!)) but that was undoubtedly thanks to Chris’s presentation which was simply fantastic (see here on i Player for 25 days). More on Alan Turing here. A true icon, but don't forget Tommy Flowers. Chris's presentation was indeed simply fantastic. I now see more clearly why the self-interested nature-destroyers fear him. That's another great quote,from Alan Turing one of the many Geniuses from Bletchley Park,I've got to say how Fantastic is that Slate Statue ! He's even working on the Enigma Machine !